In order to distinguish a form submission by a computer program versus one from a human, and also to block them, you’ve been able to use CAPTCHAs with Contact Form 7. However, CAPTCHAs are hard to use in some cases. Some people have difficulty in answering CAPCHA, or simply dislike answering them. Managing CAPTCHA needs graphic libraries installed on the server, which are not always provided. In some cases, a simpler approach is more suitable. With this quiz feature, you can do it by using question/answer testing with simple text that you have the flexibility to create. The content before the pipe (‘|’) character (The capital of Japan?) will be used as the question. The content after the pipe (Tokyo) will be used as the expected answer. You can use any question and answer. To submit the form, the sender has to input the correct answer. 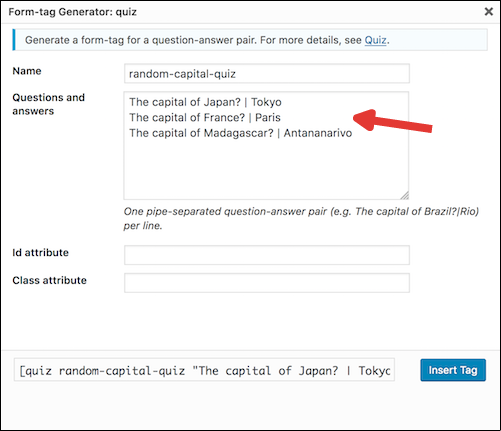 When you put multiple question/answer pairs in a tag, one of the pairs will be selected at random. [quiz random-capital-quiz "The capital of Japan?|Tokyo"
class:(class) class:bar class attribute value of the input element. To set two or more classes, you can use multiple class: option, like [quiz capital-quiz class:y2008 class:m01 class:d01 "The capital of Japan?|Tokyo"]. In the tag generator for the quiz tag, make sure to enter one pair per line.